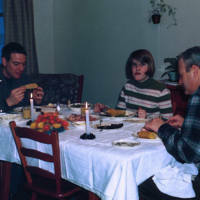 A image showing lunch with Father Brown. A image showing another lunch with Father Brown. 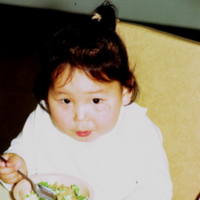 The image shows a child eating some kind of salad. Elder Amos Tumma is telling stories of hunting, fishing, trapping, and his many travels and how he and others lived long ago as well as the many changes. Joe Nasogaluak Life stories June to November 1921. A Long Time Ago host Louie Goose airs Joe Nasogaluak storytelling about his life stories from June to November 1921. 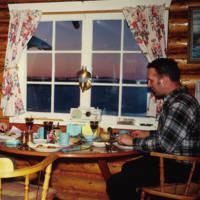 A Long Time Ago host Louie Goose airs Joe Nasogaluak storytelling. Joe is telling life stories from the years from late 1916 up to March 1917. CHAK host Louie Goose introduces Susie Tiktalik being interviewed by Alexandrea Elias. Susie is telling Part II of her life story and also sings a song. Johnny Ruben is telling a story about an old lady and her grandson who were abandoned and left for dead. Elder Johnny Ruben is storytelling about how Inuvialuit people lived long ago, always busy preparing for hunting and fishing, and preserving food to last for the year, Christmas gatherings, and more. Host of A Native Voice Edward Lennie provides local and regional news then William Kuptana is storytelling about searching for caribou during lean times. The story was already in progress. Aklavik Elder Hope Gordon is storytelling about where and how they lived in Alaska, Part 1. To be continued. Interview with Jack Alanak on language, culture, and hospital followed by Robert Kuptana speaking with Charlie Avakana who is telling an old time story and interview on language, culture, food, education, land, and land claims, etc.